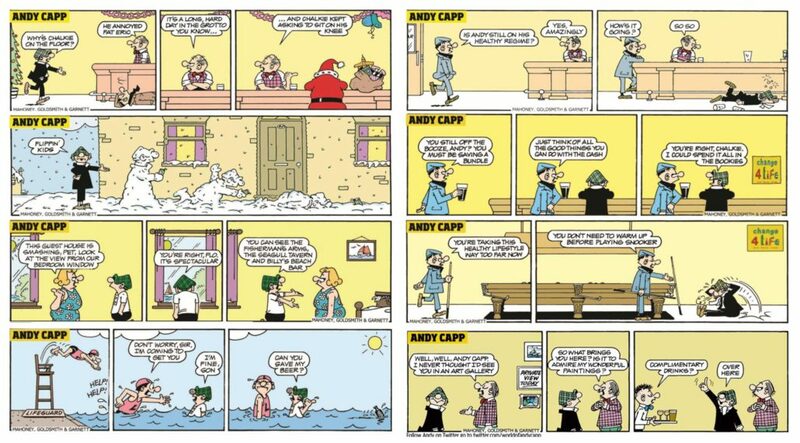 Andy Capp has been a favourite of the Daily Mirror since 1957. A lovable rogue who over the decades has evolved to match the ever-mutating society around him, without changing too dramatically himself. As attitudes altered, so did the cartoon strip. Over the years, Andy’s character has mellowed somewhat from the hard-nosed man of old to a more sympathetic sort. But he still has a quick wit and a tongue that can bring down anyone on their high horse faster than an Apache arrow. Today Andy retains the domestic landscape of working class that comes with the daily struggles of life on the breadline of the early strips so brilliantly crafted by creator Reg Smythe. But there is now more in-frame action with slapstick and knockabout humour that results in highly visual displays and a wide range of expressions expertly crafted by top illustrator Roger Mahoney.